Featuring quality built homes priced to sell, Longbridge sets a new standard of excellence for affordable resort living. These one-story 3- and 4-bedroom homes range in size from around 1,600 square feet to 2,715 square feet at prices from the low to upper $200s. And in addition to its many fine existing homes, this neighborhood that’s one of Barefoot’s newest offers new construction in six floor plans. 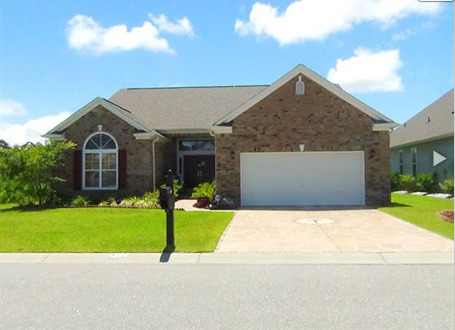 Homes feature low maintenance exteriors, optional sunrooms or screened porches, and fully sodded and professionally landscaped lawns. High ceilings and luxurious master suites are just two of many upscale interior appointments. Of course, owning a home here comes with the fantastic privileges and amenities offered by Barefoot Resort including the Residents Club with a huge pool, first-class fitness facility, tennis courts, basketball court, game room, library and more. The clubhouse itself is the center of community life with kitchen facilities, bathrooms, covered patio and more that’s perfect for gatherings of any size. It’s also the site of a variety of enrichment classes offered throughout the year by Barefoot. Other amenities that come with home ownership include the full service Barefoot Yacht Club Marina, great restaurants, and four of the world’s best golf courses designed by golfing royalty – Davis Love III, Pete Dye, Tom Fazio and Greg Norman. Known as some of America’s finest courses, they also feature world-class practice facilities, pro shop and golf instruction. 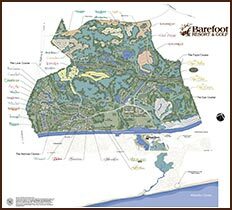 Residents can also avail themselves of numerous lakes and parks and miles of walking and biking trails meandering through Barefoot’s spectacular 2,300 acres. In addition, just minutes away is the unique shopping and entertainment complex of Barefoot Landing next to the Intracoastal Waterway with boardwalk shopping around the 27-acre lake as its center. Home to scores of fantastic shops of every kind, Barefoot Landing is also home to 15 great restaurants and entertainment venues with well-known names like Alligator Adventure, Alabama Theatre and House of Blues. And less than 3 miles away are the beautiful blue waters of the Atlantic, with free shuttle service to take residents to the resort’s private cabana.